Here is how to follow the treasure map found in Haunted Hills, with a screenshot of the location you need to visit. There are only a few more days to tick this challenge off your list – Fortnite Season 5 starts on July 22, so you’ll need to have completed this by then. This week’s treasure map isn’t sending you far. Just north of Haunted Hills is the junkyard Junk Junction. 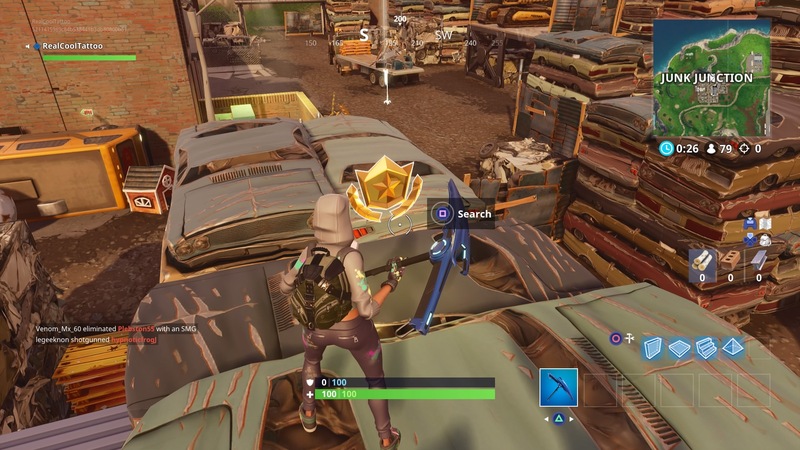 In the central north of Junk Junction, you’ll find the hidden Battle Star on top of some silver scrapped cars. If you grab it this weekend you’ll earn double XP as Epic has a promotion running until Monday. When you’re done with the hidden Battle Star, it’s time to try and visit the center of Named Locations in a single match – check out our guide if you’re stuck. If that wasn’t hype enough, we’ve also had confirmation that Fortnite Season 5 will start in the second week of July. For a hand with the rest of the week 9 challenges in Season 4, take a look at our full page.